Depending on what kind of diet you’re used to, switching to Paleo can be a little rough on your digestion. 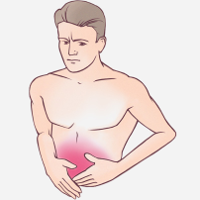 Some people get constipated; other people get nausea or bloating, or sometimes diarrhea. It doesn’t happen to everyone – it depends a lot on your individual gut and also what you’d been eating before you went Paleo. If you were already eating a diet fairly high in vegetables, then going Paleo might not be such a shock. On the other hand, if you were eating a lot of refined carbs without much fiber, then the sudden pile of greenery may take a little adjustment. Here’s a quick look at what causes the problem and what you can do to feel better. Why is this Happening? Help! Your gut flora need time to adapt. Gut flora are the friendly bacteria that live in your digestive system. Different species of gut flora thrive on different diets, especially diets with different amounts of fiber, because fiber is what the bacteria eat. Just like human populations, gut flora populations can only grow if they have enough food. You’ll get more of whatever bacterial species you feed (by giving them the particular type of fiber they like to eat), while the ones you don’t feed will be less abundant. That’s why there are such dramatic differences in gut flora between people eating different diets. So if you’ve been eating a fiber-poor diet, then your gut flora are adapted to that kind of diet. You don’t have the species you need to digest a lot of fiber, because you haven’t been giving them enough food to support large numbers of them. If you dump a whole lot of fiber onto a bunch of bacteria that aren’t prepared to digest it, it can cause gastrointestinal symptoms until your body adjusts. That’s especially true if the fiber includes a lot of FODMAP carbohydrates, a type of fiber that can be especially hard to digest. It’s possible to change the composition of the gut flora with diet changes (and by other means, like antibiotics, exercise, sleep, stress management, and probiotic supplements), but this takes time, and in the meanwhile, overloading your gut with types of fiber that it isn’t prepared to digest can be uncomfortable. Your enzymes need time to adapt. Just like your gut flora, digestive enzymes are a use-it-or-lose-it resource. Several studies have shown that when people stop eating meat, their pancreas make less of several enzymes necessary to digest animal protein. That’s why people often feel uncomfortable if they switch from a vegan diet to an omnivorous diet: their bodies just aren’t used to producing the necessary digestive tools. It’s very possible to start that process up again, and plenty of ex-vegans do exactly that, but it’s initially uncomfortable while your body figures out that oh wait, you actually do need that chymotrypsin now. If you switched to Paleo from a vegetarian or vegan diet, this may be why you feel lousy. You’re eating a lot more coconut oil. Coconut oil is notorious for speeding things up – if you eat too much of it, it can cause diarrhea or simply very urgent stools. When some people go Paleo, they get really coconut oil-happy and start slathering it on everything, which isn’t necessarily bad once you’re used to it, but if you start it all up at once without a chance to adjust, it can be pretty rough. These are just a few of the most common possible reasons – there are certainly also others that might be affecting you. OK, so you know why the problem might be happening. Now what to do about it? If you’re having really bad symptoms, consider slowing your roll a little. Paleo will always be here when your body is ready for it. It’s perfectly OK to go step by step and let your body get used to everything slowly. It may be helpful to start with a small serving of vegetables at every meal, and try low-FODMAP vegetables, like zucchini (or any other type of squash), carrots, spinach, and salad greens. Gradually scaling up instead of dumping a huge salad on your plate every day can make a big difference. Probiotics and probiotic foods can also be very helpful – here are some pointers on choosing a probiotic for your particular needs. Another overall great strategy is to pay attention to lifestyle. How are your stress levels lately? How’s your sleep? Most people tend to look for digestive problems in food, but there’s strong evidence that sleep and stress can noticeably affect digestion regardless of what you’re eating. Partly, that’s because they modify the composition of those all-important gut flora, and partly it’s because human beings have two big-picture hormonal settings: “fight or flight” and “rest and digest.” If you’re stuck in stressed-out, sleep-deprived “fight or flight” mode, all the physiological processes that you need for digestion (like a lot of blood flowing to your stomach) get turned off. Coffee is a classic for a reason. Caffeine is a mild laxative, although go carefully with it if you’re also working on stress. If you’re not into coffee, try tea. In one study (admittedly in mice), Pu-erh tea helped alleviate constipation, and the researchers suggested that the active components of the tea may be found in green tea as well. If you’re still eating butter, try eliminating it. Some studies have found that one symptom of cow’s milk allergy can be constipation. While you’re at it, you might as well switch to coconut oil, which has a laxative effect in a lot of people thanks to the particular types of fat it contains. Try magnesium supplements. Magnesium draws more water into your colon, which makes your stools softer and easier to pass. You can read more about this here. Try getting rid of coconut oil and using another healthy cooking fat, like olive oil or animal fat. Because of the particular type of fat in coconut oil, it often has a laxative effect. 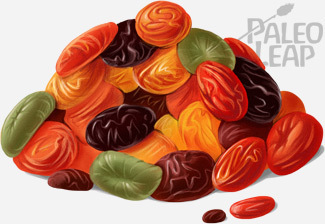 Dried fruit: not the best choice for people with fructose malabsorption. Try cutting down on fruit, especially dried fruit, if you’re eating a huge amount of it. The sugar in fruit draws water into your intestine, which can cause diarrhea. 1-2 pieces of fruit per day is unlikely to cause any problems, but if you’re eating several handfuls of raisins or huge amounts of apples or something, you might be suffering from fructose-related diarrhea. For bloating or feeling like there’s a “brick in your stomach,” try digestive enzymes. While your own digestive enzymes are ramping back up, taking a supplement might help bridge the gap. One of the coolest things about the human digestive system is how well it adapts to so many different diets. Whatever you’ve been eating, your gut flora and digestive enzyme production are finely tuned in to digest that. This even shows up on an evolutionary scale: different populations have evolved different adaptations to their diet, with the best-known example being people in Northern Europe developing lactose tolerance. The down side is that drastically changing your diet can be a really big shock to your digestive system, and the symptoms can be uncomfortable. Most people do eventually adapt to the new routine, but there’s no reason why this has to involve two weeks of suffering. It’s OK to go slow and transition gradually. It’s OK to start with small servings of vegetables and gradually work up to the full Paleo template with a huge pile of greens at every meal. There are also plenty of other strategies you can try, like experimenting with probiotics, digestive enzymes, and other supplements depending on what your particular problem is.